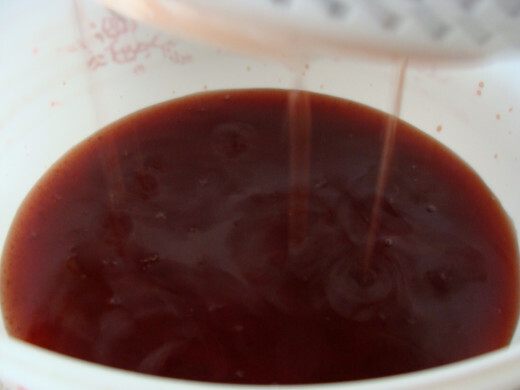 How would you rate this cherry liqueur recipe? The beginning of July in Michigan is a cherry extravaganza! Traverse City, Michigan claims that it is the cherry capital of the world and it hosts a delicious festival every year around the 4th of July. While I'm not really convinced that it is the cherry capital of the world, I would definitely agree that it is the cherry capital of the Midwest. 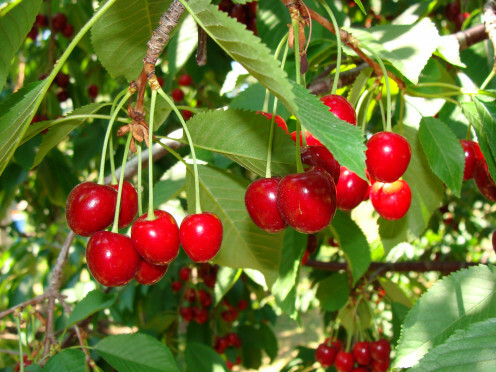 I am fortunate enough that my in-laws have a farm with an abundance of fruit trees, some of which are cherry trees. 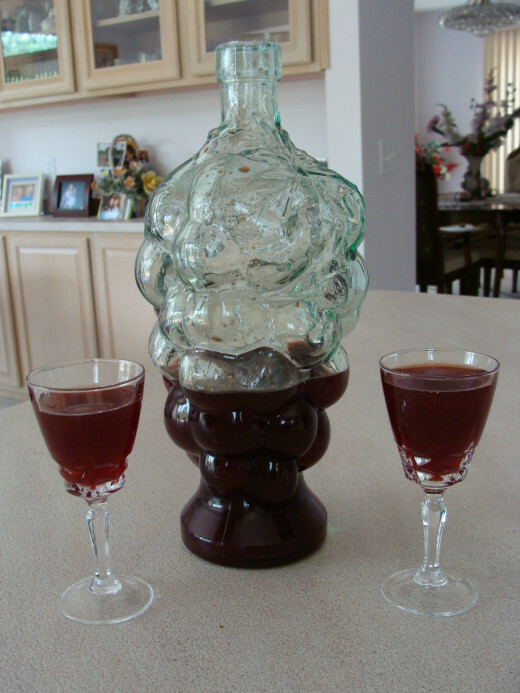 Along with the more standard cherry fare, like pies and coffee cakes, a favorite among the adults is homemade cherry liqueur. 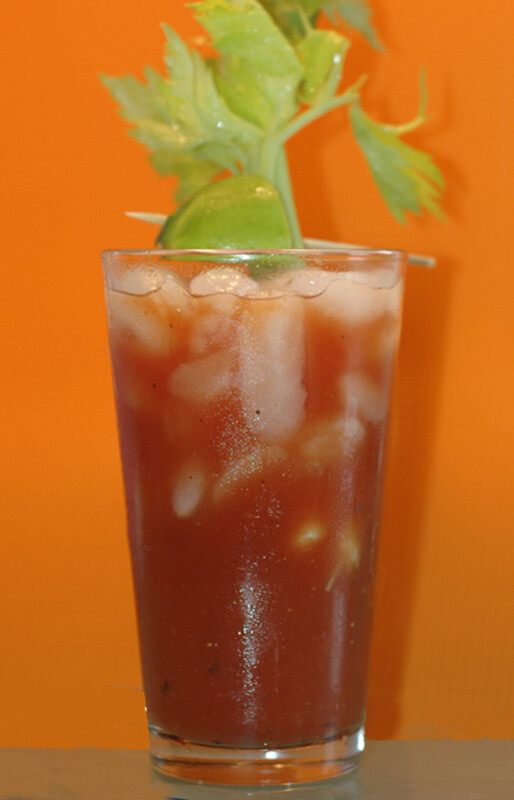 It is so delicious that it has because the expected drink to be served at summer gatherings at my house. Even my neighbors now expect me to bring some along when we have our neighborhood bonfires. The gorgeous dark red color, thick syrupy and sweet taste of the drink, along with the intensity of the alcohol will make you want to go back for more. The best part? It is sooo easy to make and it will last you a good amount of time. Well, that is if you don't have friends that like it as much as mine do. So I guess you'd better make a large batch! 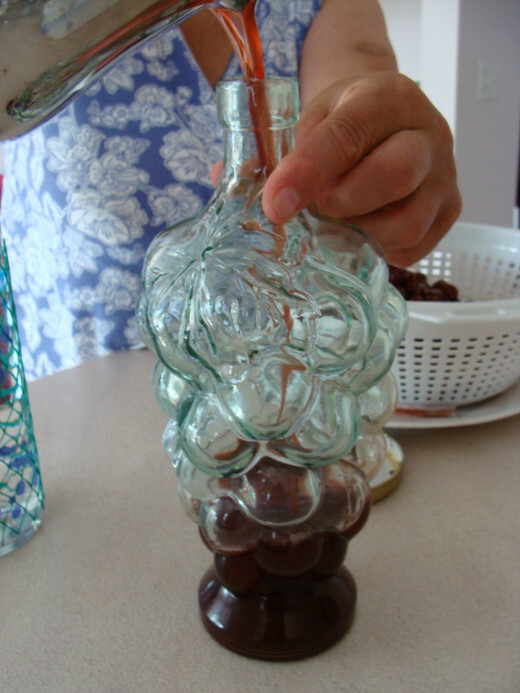 Put about 5 pounds of tart cherries in a glass jar. Add about 2-3 pounds of sugar. 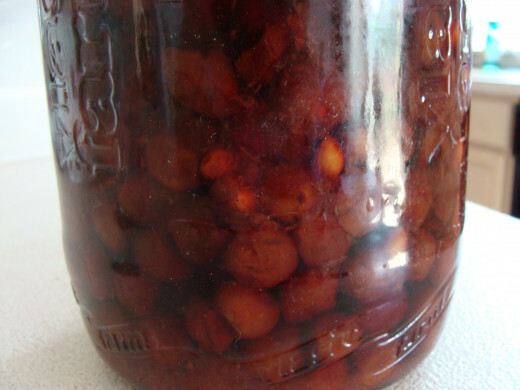 Place cap on the jar and let sit in the sun for about a week. Be sure that the sugar has completely melted. This will form a syrupy mixture. 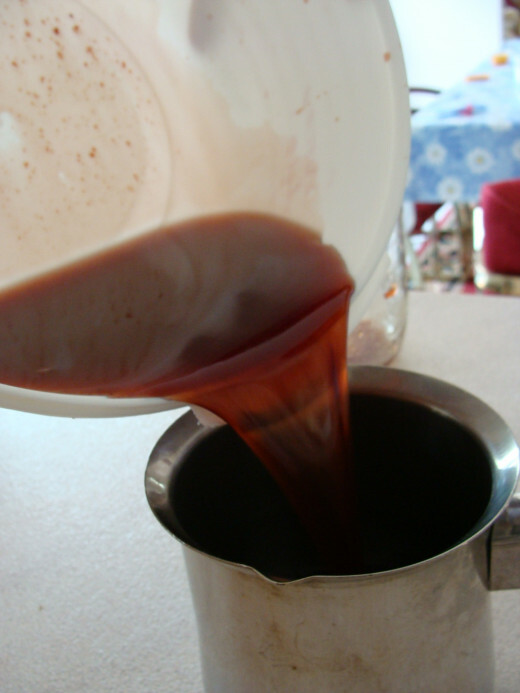 Once the sugar has dissolved, strain the cherries so that the liquid is in a separate container. 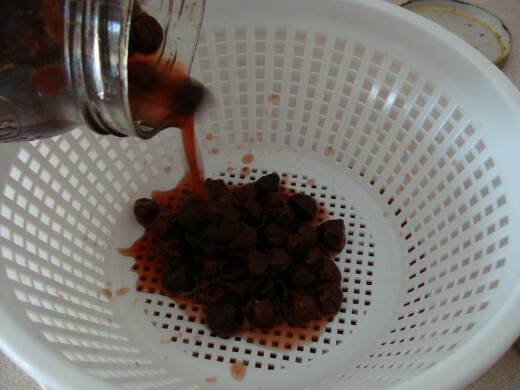 You can use the cherries for another recipe, discard them, or keep a few to add to your drink when it is served. 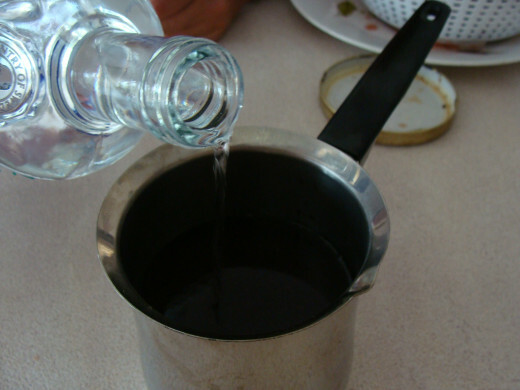 One cup at a time, add equal parts of cherry juice and vodka. Pour into glass jars to store or into glasses to serve. This is a beautiful, delicious, and easy gift to give to friends and family for the holidays or for a host or hostess when you are invited for a gathering. You can easily find some beautiful decorative glass jars to place your homemade liqueur in with a customized label for your friends and family. Please be aware that this is not cherry wine and should not be served or drank from a large wine glass. 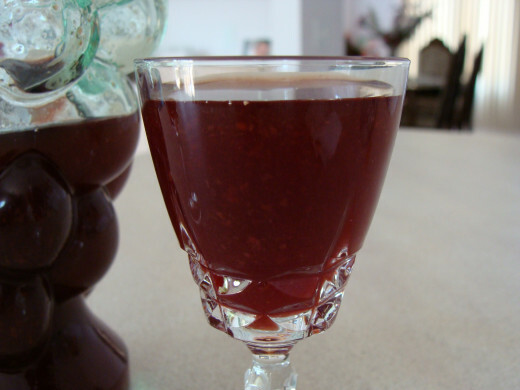 It is best served in a cordial glass where one can sip the drink slowly and enjoy the cherry flavor. Hehe, thanks! When we were in Cleveland this weekend I had a blueberry drink that was some sort of fermented blueberries mixed with a sort of moonshine. Alex called it something else but I don't remember what it was called. Anyway, I actually really liked it. Oh my goodness! My, my, my! I want this very badly!!! Lol. I;ve totally going to try this and I hope it turns out as well as yours looks! Voted useful, up, and awesome!!! We will be well stocked for your visit! 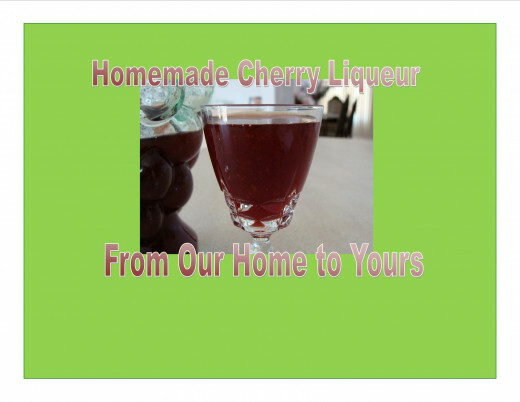 I've heard of other homemade liqueurs before, but never anything made with cherries. This is so cool! Thanks for the recipe. It is a fun gift idea internpete. Yes, there usually are lots of cherries in Michigan. Unfortunately this year the very early warm weather brought out the blossoms too soon and the frost caught them. The orchards in Michigan are at about a 90% loss of fruit (for all types) this year. It is very disappointing to us but thankfully I froze some last season so I still have some to work with this year. Well mts, my father in law would say, 'just eyeball it!' It is supposed to be equal parts juice to vodka but of course you can make it stronger (ahem...) or weaker depending on your personal taste. Thanks for stopping by. Michigan cherries are delicious! Of course I am biased. :) Thanks for your continued support teaches! Yes, medicinal indeed chef-de-jour! Hope you enjoy it and thanks for your visit. it is wonderful to have those trees. We are very fortunate not only to have that fresh fruit but such an abundance of it to cook and bake with. Glad you are going to give it a try vespawoolf! LOL, I'll be sure to save some for you Alissa! We'd be thrilled to have you and those cutie pie boys of yours as our neighbors! It is tasty. I'm not a huge drinker but I enjoy a drink on occasion. If you ever get a chance to taste it, give it a try! Thanks for your visit Crystal. Interesting Anil and Honey. Maybe it is just the type of cherry that is different. There are several varieties that are popular here in the US. Thanks Kelley! It is very easy. This sounds like a lot of fun, and a great gift idea! Plus, lots of cherries in Michigan! Ooooh, the first photo is so inviting! I remember when we lived in the Midwest the Michigan cherries were always bought out first in the grocery store. They do have a sweet, juicy taste. Great home-made recipe idea. Cherries are such a fascinating fruit, the way they bunch on the tree so delicious looking when ripe. Extracting their essence mmmm...great idea. Thanks for this, another medicinal recipe to try! This recipe is right down my alley! How nice to have fruit trees in the family. We get wonderful Bing cherries from Chile in December, right before Christmas time. I've marked this recipe to try. Thanks so much...love the photos and writing. Voted up and shared. 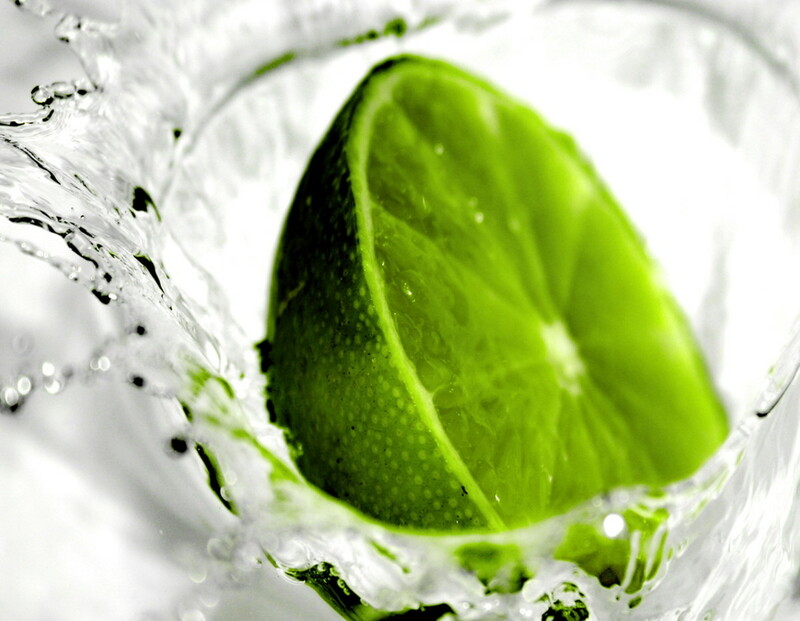 I've never been a fan of liqueur, but this actually looks tasty! I love cherries. Cara, this does look very easy to make and maybe I should try some when I'm up in MI (if you have any left!). But right now I can't seem to get past the "sweet" cherry liquor description. 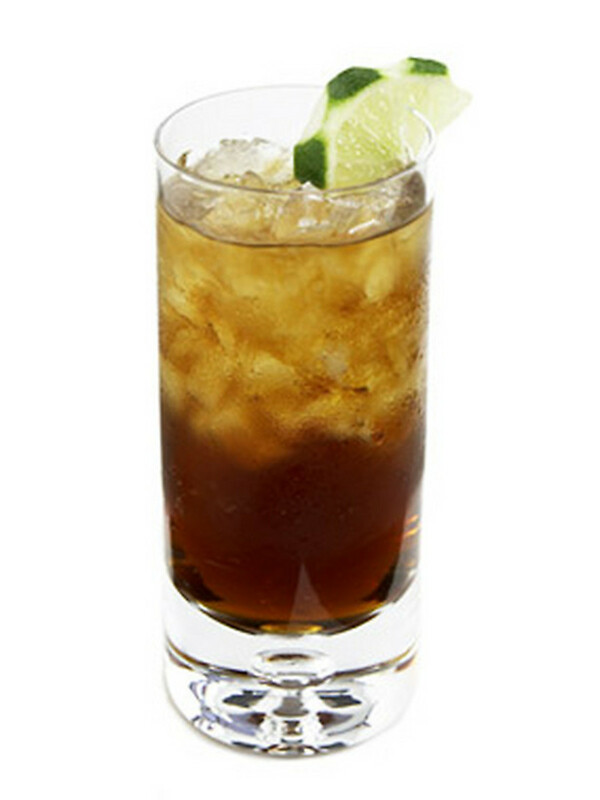 I usually don't like sweet drinks (I go for the whiskey, mind you, shades of Nona!) although even as I'm writing this, I'm enjoying a grownup "soda" of Bailey's and ice cream! Cherry is my favorite fruit. But i thank that your cherry differ from my(Indian) cherry.Your image shows it. Thanks Heather. It really is easy and I don't think I would have believed it if I hadn't tried it myself. Thanks for your comments! Wow! You make it seem pretty easy to pull off. Great hub! And I absolutely love that grape-bunch-shaped bottle. Beautiful!